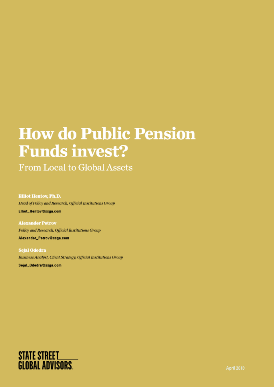 How Do Public Pension Funds Invest? Public Pension Funds (PPFs) are highly idiosyncratic and distinct from other types of institutional investors. The universe of investors that fall within our definition of a PPF is numerous and varied. We count 115 institutions in 70 jurisdictions, diverse in geography and economic development. For the purposes of our study, we examined the top 16 funds whose assets constitute just over two-thirds of the total universe. Despite all the idiosyncrasies of PPFs, we have found some shared characteristics in the evolution of their asset allocation over the past decade. According to our definition, PPFs held around $5.9 trillion in total assets of 2016 and over 4% of all publicly traded assets, making them a significant global investor group. In particular, given their preferences for specific asset classes, their share is disproportionate in some segments. For example, we estimate that by year-end 2016, PPFs owned over 7% of global tradeable fixed income assets (including 8% government bonds and over 13% of inflation-linked bonds) and over 3% of listed public equities. Similar to other asset owners, PPFs have undertaken a major reallocation of assets over the past decade. However, the motivating driver has not only been the low yield environment, but also changing regulatory and macro policy settings, which either permitted or encouraged greater diversification along asset classes and geographical exposure. In detail, the most dominant trend has been the move away from holding domestic (local currency) bonds; in their place, PPFs have redeployed assets towards equities and alternatives, with a small share also diverted into foreign bonds. These allocation trends have been almost universal despite a huge diversity of geography and economic development. It is important to acknowledge how much this investor group has changed over the past decade, with the asset pool growing by over 40% in dollar terms, and even more if measured in local currencies. 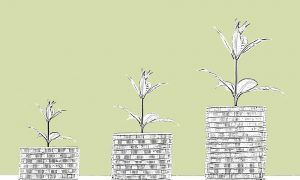 While some funds are still predominantly captive buyers of government debt, the bulk of PPFs have been transforming into financial institutions with independent firepower and income-generating capacity. The long-term trend towards more diversified fixed income portfolios is likely to continue, as is the shift towards taking on more risk via equity allocations, subject as ever to changes in market cycles. In this context, we expect most PPFs to not only continue taking on more risk overall, but to further internationalise their portfolios. Finally, one consideration is that maturing funds catering for aging populations will have to make further adjustments to their asset allocations to account for changing cash flow directions and seek greater contributions and investment returns to bridge any funding gaps. This document may contain certain statements deemed to be forward-looking statements. All statements, other than historical facts, contained within this document that address activities, events or developments that SSGA expects, believes or anticipates will or may occur in the future are forward-looking statements. Please note that any such statements are not guarantees of any future performance and that actual results or developments may differ materially from those projected in the forward-looking statements.